– Setup now runs ngen.exe for faster program startup. What is ngen? – Setup now opens ScriptFTP and the Lesson 1 of the FTP scripting guide after finishing the install. – Setup shows the End User License Agreement (EULA) before installing. Nothing changed in the EULA but it seems that in some countries this is required before installing any software. – Fixed some weird quoting bugs in the EXEC command. – When plain FTP is used a warning message is shown when OPENHOST is called. – Fixed $ in passwords. String expansion which was a hidden feature has been removed. – If SETPORT is used SETPROTOCOL will not set the port automatically and will keep the port set beforehand. Is that possible to run ScriptFTP automatically as a service everytime when Windows starts? If its possible to automate startup on logon? Scheduling ScriptFTP this way you can set it to be run not only at a given time but also at startup, at logon, on idle, when the user connects or disconnectes and also when the screen is locked or unlocked. I would like to obtain the encryption tool. It is needed to buy a license in order to get the script enryption tool. You can find more information here. 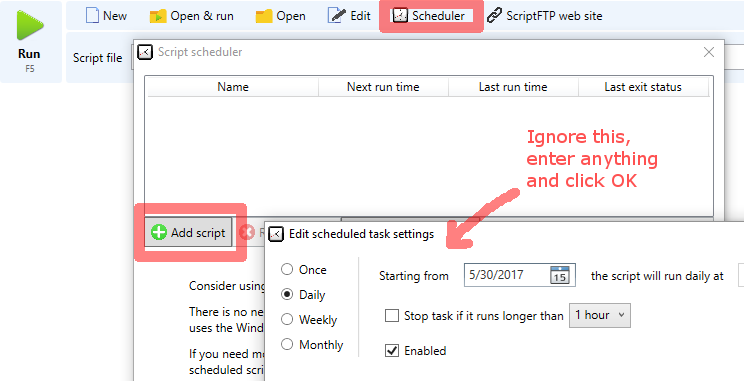 You need to create a scheduled task within ScriptFTP and then open the windows task scheduler (usually under the control panel). Once you have located that task in the windows scheduler, open it and go to the “Triggers” tab. There you have to schedule the task to be run daily at, for instance, 00:55 and to be repeated every hour for one day. 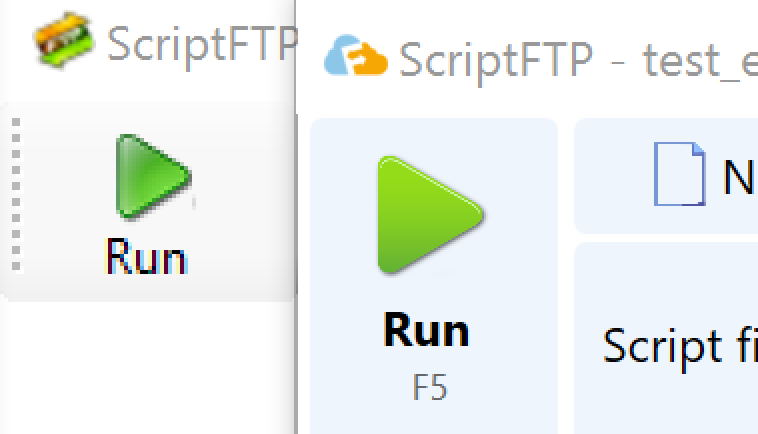 ScriptFTP has commands to retrieve files from FTP sites only but it can also download files from the web (HTTP/HTTPS) using an external tool like CURL. You can download it going to this page. The Windows version of CURL is almost at the bottom of that page. Note that HTTP authentication is not the kind of authentication you commonly find when going to web sites like yahoo mail, gmail etc. These are just HTML forms. You can identify HTTP authentication when the browser asks for the login in a very spartan pop-up window on top of the web browser. The ScriptFTP scripting language does not have data types (as most scripting languages) and dealing with anything which is not plain text requires some kind of tricks. This happens with file lists as we have seen before, dates and time spans suffer the same limitation. This post covers how these data types are handled in ScriptFTP. ScriptFTP, as many script languages, does not have data types. This makes the script language and its syntax a lot easier to learn but not as powerful as others. Think of it as being “not so descriptive” and “less complex”. The drawback, in practice, is that you cannot handle things like “lists”,”sets” etc. Everything is a plain text string and you need to deal with this limitation to get the things done. The ScriptFTP integrated scheduler is used to set a script to be run at given times. Once a script is scheduled the Windows Task programming service will automatically launch ScriptFTP.exe with the appropiate parameters and a window will pop-up in the user desktop and do the file transfer. Some users find this annoying and want the FTP script to be run in the background. This post covers this issue. The status bar shows buttons to quickly access to script autorun and script output settings. Updated security SSH and SSL protocols with the latest revisions. Since the version 3, ScriptFTP has relied Windows Forms to build its buttons, panels etc. This is one of the many available tools that we the software developers use to build user interfaces, a very popular in fact. But since high density displays (high DPI displays) are becoming more and more popular, users of the apps that use this technology notice that they look bad on their shiny new screens. They only have two choices: scale everything up, making these apps look pixelated or keep their original size and struggle to understand anything on the program because every element is shown tiny, almost unreadable. If you want to try the beta version feel free to drop an email at support@scriptftp.com . Most of the things are already working except the script scheduler.